DOWNTOWN — When Chicago artist Jaclyn Jacunski encountered an abandoned lot near her home, it prompted her to pay closer attention to vacant spaces throughout Chicago and the debris that occupied each site. The Logan Square resident zeroed in on how fences are used to delineate each space. Her resulting work, on exhibition at Harold Washington College this season under the title "Now is the Time," uses plastic and metal fencing samples collected from lots as stencils, stamps and materials themselves. 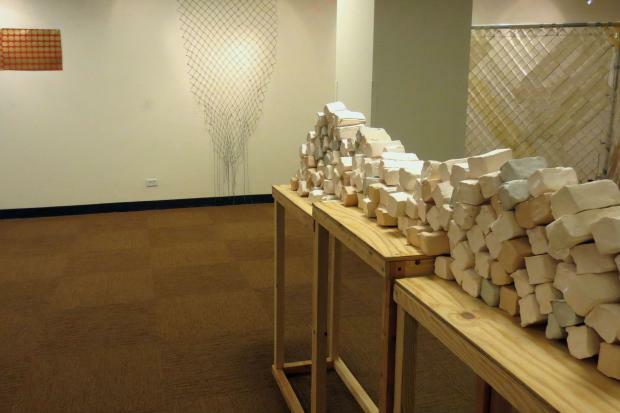 Works on display at the college's President's Gallery at 30 E. Lake St. include clay sculptures shaped by being pushed through chainlink fencing and woven pieces meant to resemble fencing dyed with materials found in vacant lots. The exhibition is free and open to the public from 10 a.m. to 5 p.m. Monday through Friday until it closes Jan. 2. Appointments can be scheduled with the art department at 312-553-5738. Jacunski will also give a lecture about her practice at 11 a.m. Nov. 25 in the gallery, followed by a free workshop from 1-3 p.m.
Jacunski was last spring's artist in residence at Spudnik Press and directs the Chicago Printer’s Guild.